John Owen (1616-1683) was one of the defining theologians in the Christian era. His books have been continually in print and are still influential today. Educated at Queen's College, Oxford, he was a moderate Presbyterian who became a Congregationalist after reading a book by John Cotton. He later helped draw up the Savoy Declaration, the Congregational Basis of Faith.During the English Civil War Owen was wholly on the side of the Parliamentarians, accompanying Cromwell on expeditions to Scotland and Ireland as Chaplain. Owen was influential in national life and was made Vice-Chancellor of Christ Church Oxford. After the Restoration of the Monarchy he was ejected from this position and devoted his energies to developing 'godly and learned men', in writing commentaries and devotional books, and in defending nonconformists from state persecution. John Owen by Andrew Thomson was published by Christian Focus Publications in October 1996 and is our 30270th best seller. The ISBN for John Owen is 9781857922677. 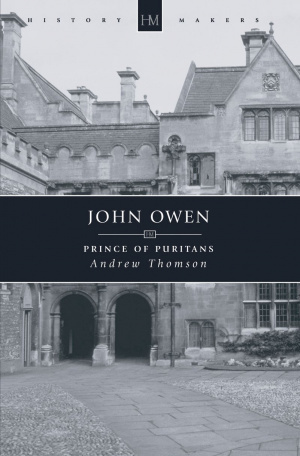 Be the first to review John Owen! Got a question? No problem! Just click here to ask us about John Owen.